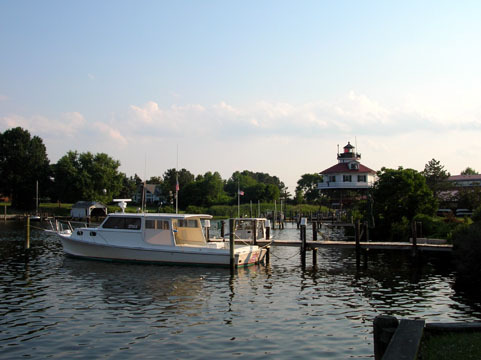 Drum Point Lighthouse from the pier in Solomons, Calvert County, Maryland. There are four stories, all open to the public and all restored to 1906 condition when the granddaughter of one of the last lighthouse keepers who endowed the exhibit was born there. 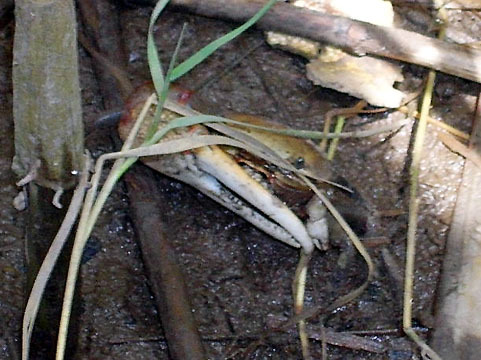 A fiddler crab hides in the grass in the salt marsh at the Calvert Marine Museum. 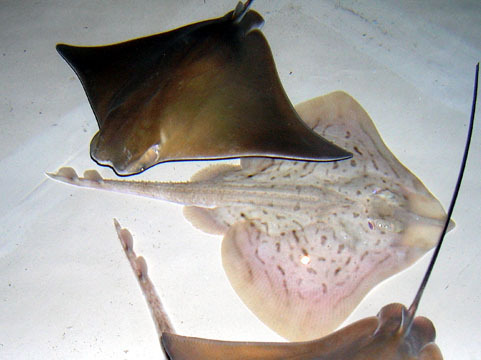 Cownose rays swim over a skate in the tank in the "Secrets of the Mermaid's Purse" exhibit tank. 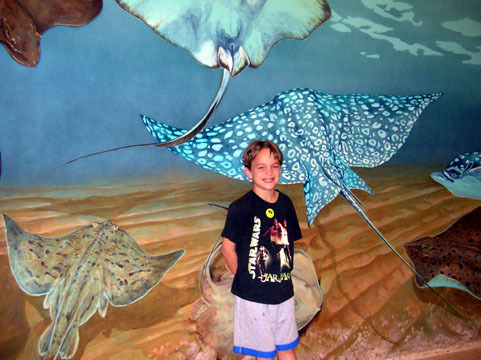 Adam at the entrance to the ray and skate exhibit. I was expecting a small local museum like some of the marine museums we visited in the Outer Banks and on the Delaware shore, and we were all pleasantly delighted to discover that in addition to the lighthouse the museum was far larger than we expected, with several exhibits on local archaeology and paleontology, an exhibit on the Patuxent River and the War of 1812 and a history of shipbuilding in Calvert County. 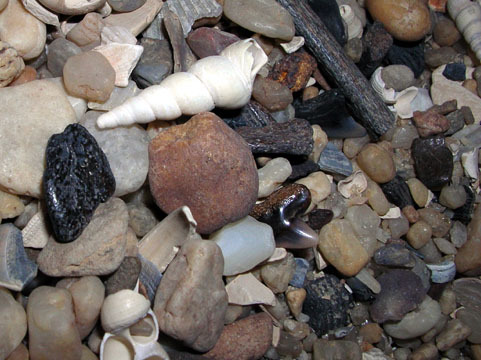 Shells, bone fossils and a shark's tooth in the fossil pit where kids get to find, identify and take home a treasure. 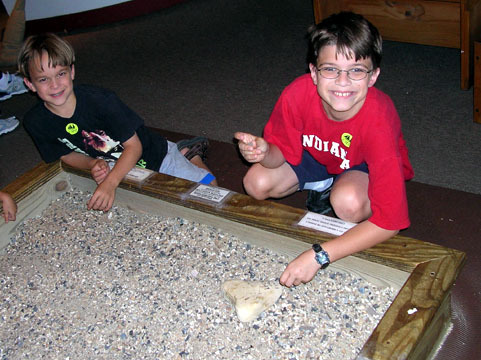 Daniel and Adam digging for shark's teeth. 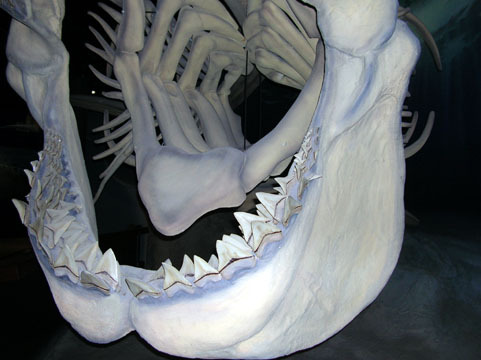 The mouth of an extinct shark, carcharodon megalodon. Those front teeth are larger than my hand. 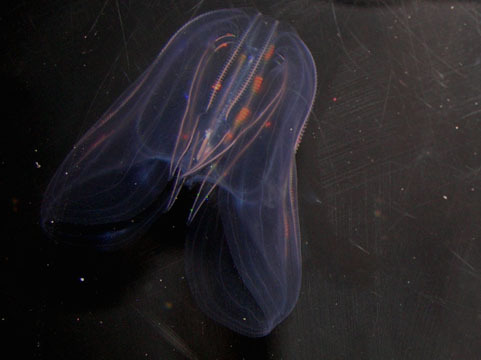 A sea walnut in the estuarial biology exhibit. 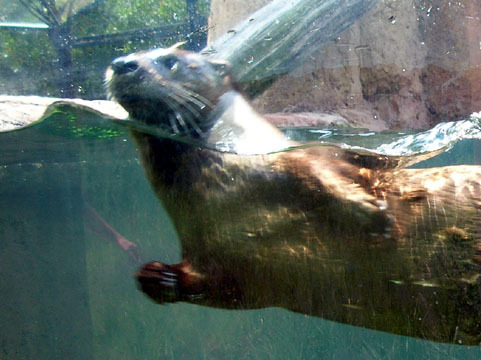 One of the otters (a pair, male and female) in the outdoor exhibit. The edge of the salt marsh from the second story of the lighthouse. 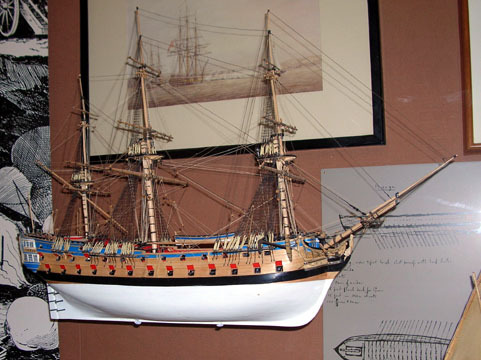 A model by Al Chesley and painting of HMS Augusta, 64-gun ship of the line, one of five Royal Navy warships of this size or larger present in the Patuxent River during the summer of 1814. The Chesapeake Flotilla kept the British at bay for four months, but the British army marched north through Charles County -- the only time Maryland's shores have been invaded by a foreign army -- and the flotilla was scuttled and sunk to prevent capture so that its men could join the land defense just before the British burned Washington in August. British General Robert Ross was so impressed by the actions of American Commodore Joshua Barney that he pardoned all of Barney's "Bluecoats" -- a decision he later had cause to regret when the British fleet was kept out of Baltimore's harbor by men in Fort McHenry while Ross, who led the land attack, was mortally wounded by one of Commodore Barney's pardoned sharpshooters. 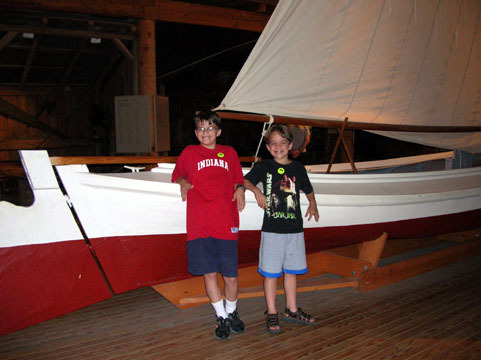 Daniel and Adam beside one of the locally built ships on display in the museum. 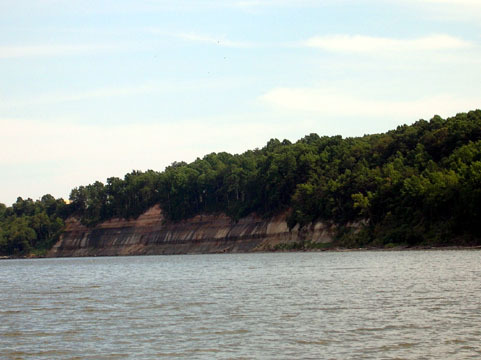 Calvert Cliffs, home to both thousands of fossils and a nuclear power plant. 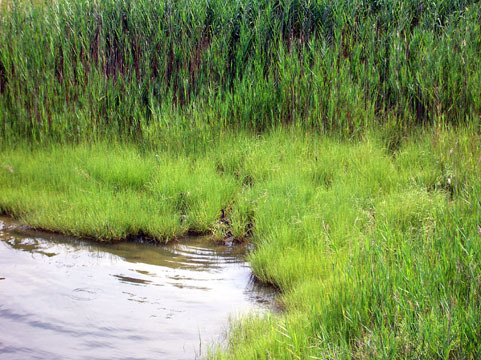 The power plant is surrounded by a wildlife preserve and state park, so the area is exceedingly beautiful. 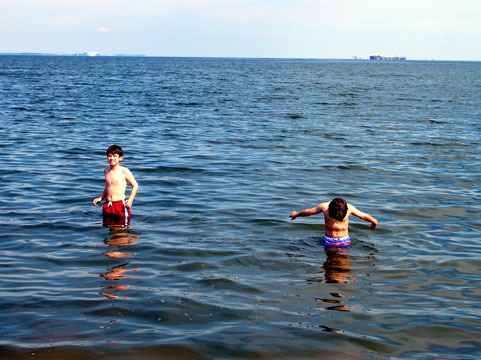 The boys in the Chesapeake. The Chesapeake Bay was very warm, about 85 degrees -- by late afternoon the air was actually cooler -- and the salinity was low enough that we did not encounter any jellyfish, so we spent nearly two hours in the water, swimming and wading (the bottom is very level at Flag Ponds; one can walk quite a distance from shore with the water only at waist level) and then sitting in the middle of the banks of seaweed looking for shark's teeth. The dunes at Flag Ponds Nature Center. 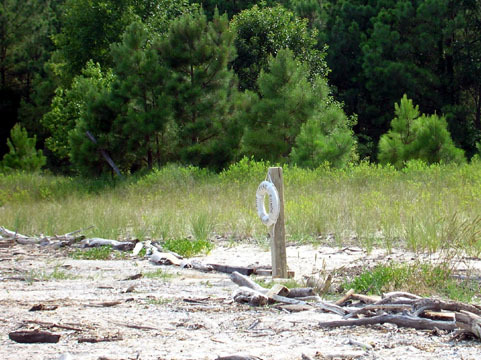 Flag Ponds has a half-mile walk to the beach from the main parking lot through the woods, where little frogs and birds can be seen in abundance, and the beach itself is famous for the ease of finding shark's teeth, bone fragments and shell fossils (much larger fossils have been found in the cliffs themselves including whale and megalodon shark skeletons, though individuals are not allowed to dig there without a permit).